Apparent victor John Curtis says he understands his rival needs some time ‘to get comfortable’ with outcome. (Leah Hogsten | The Salt Lake Tribune) Former state Rep. Chris Herrod said the race for the 3rd Congressional district is too close to call after learning that Provo Mayor John Curtis claims he's the election night winner Tuesday, August 15, 2017. Registered Republican voters in the 3rd Congressional District will decide whether Provo Mayor John Curtis, former state Rep. Chris Herrod or businessman Tanner Ainge moves forward to the general election. The winner takes on Democrat Kathie Allen and the United Utah Party’s Jim Bennett, as well as a handful of independent and third-party candidates, on Nov. 7. 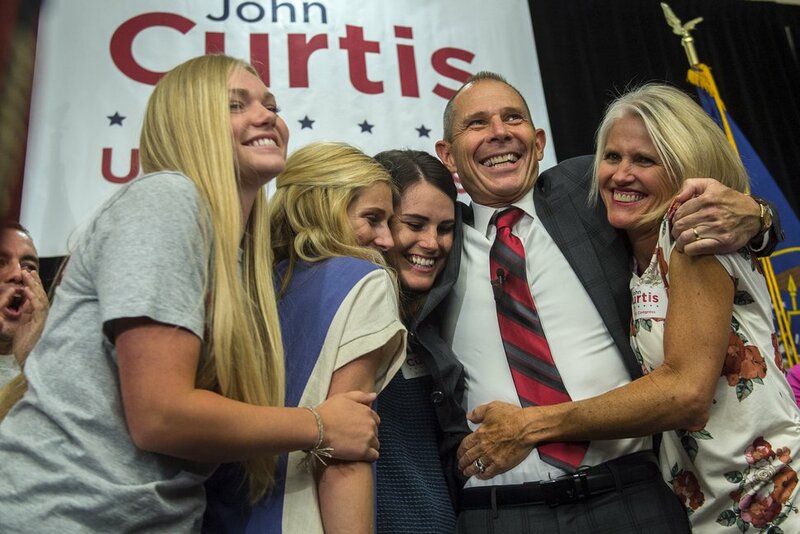 Provo Mayor John Curtis declared victory in the Republican primary Tuesday night to replace retired Rep. Jason Chaffetz. But the second place finisher, Chris Herrod, didn’t concede the race. It’s not because Herrod, a former state lawmaker, thinks he’ll win after the remainder of the mail-in ballots are counted. He acknowledges that’s not likely. Still, he thinks, it is a slight possibility. With tens of thousands of votes outstanding, Herrod is holding out for the next Utah County tally expected Friday and clinging to a shrinking sliver of hope while pressure mounts for him to bow out. “I just believe every vote should count,” he explained. With the early results posted, Herrod was behind by more than 5,000 votes — or 12 percentage points. To come back and take the party’s nomination, he would have to vastly outperform what he did on election night. “I think it is a very wide margin for Herrod to be able to overcome. It’s not out of the question, but it’s a very wide margin,” said David Magleby, a political science professor at Brigham Young University. The Associated Press called the three-way runoff before 10 p.m. Tuesday. As it stood Wednesday, fewer than 50 percent of the ballots had been processed in Utah County. There are 33,602 votes, including nearly 2,700 provisional ballots, that remain uncounted, according to clerk Bryan Thompson. 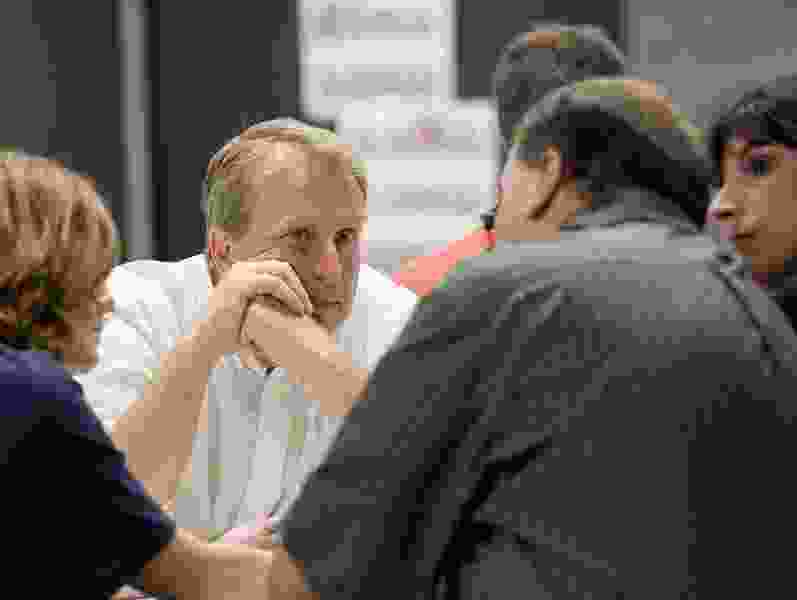 The county includes about 60 percent of the registered Republicans in the 3rd Congressional District and leaned heavily toward Curtis with the first batch of results. 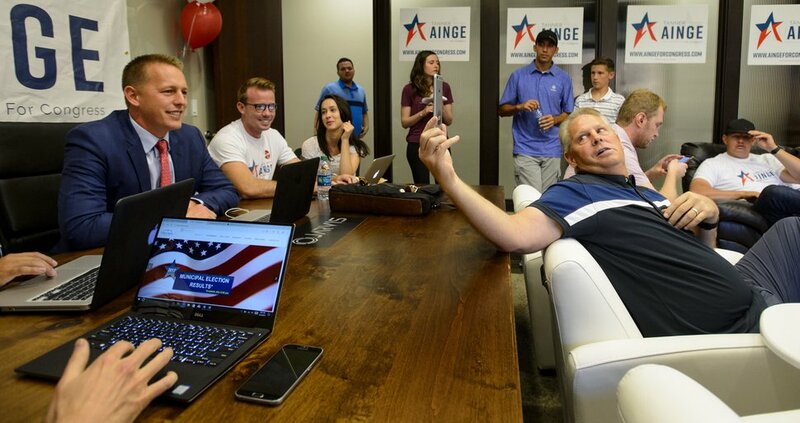 After that release, businessman and first-time candidate Tanner Ainge, conceded. (Steve Griffin | The Salt Lake Tribune) A he waits for primary results 3rd Congressional District candidateTanner Ainge talks with his sister, Ashley Lesueur, as his father Danny Ainge holds the phone at his election night headquarters in Orem Tuesday August 15, 2017. “I’m glad that our district will have a good leader and a good person like John Curtis,” he said, noting that he’ll return to the private sector. The Republican Party, too, and Utah Gov. Gary Herbert congratulated Curtis on the win. Thompson, though, believes the race is still too early to call. The difficult thing to surmise in any election, Thompson added, is how last-minute voters will cast their choice. It’s what happened in the 2016 presidential election, he said, when Democrat Hillary Clinton had the early lead but Republican Donald Trump forged a late triumph. “Didn’t we just go through this in November?” he asked. Another 15,000 votes are uncounted in Salt Lake County, where Curtis also has a significant lead, but some of those ballots are for municipal races and not the 3rd District primary, said clerk Sherrie Swensen. (Chris Detrick | The Salt Lake Tribune) Provo Mayor John Curtis celebrates with his wife Sue and daughters Nicole, Kierston and Sarah Jane during his election night party at the Provo Marriott Hotel & Conference Center Tuesday, August 15, 2017. Curtis said the initial numbers “immediately told us we were in good shape” and he has celebrated his victory. It’s OK, he added, if Herrod needs a few days to be sure of the outcome. Curtis, who launched his bid by gathering signatures, got an unexpected shout-out from Trump on Wednesday morning. “Congratulations John!” the president wrote on Twitter. Curtis, mayor of the third largest city in the state (one of the most conservative in the nation), did not vote for Trump in the election, unlike Herrod and Ainge. He instead wrote in a “good friend’s name.” He also suffered weeks of hounding by his competitors — and hundreds of thousands of dollars in super PAC spending on attack ads — for supposedly being too moderate and once being a registered Democrat some 20 years ago. Add that to the confusion caused by mail-in voting and you’ve got somewhat of a mess, Magleby said. The slow return of ballots has effectively changed elections moving forward.